Having a plain wall is so boring. You need to start to think about something that can beautify your wall by adding cool new decorations. It is time for you to make a DIY project. And DIY wall art and decorating ideas are perfect for you. It is fun, fascinating and can be a great way to decorate your empty wall space. Pallet sign is never go wrong. Make this painted red lips pallet for your wall is a great option for you who are looking for teen girls’ bedroom decoration. Fill your wall with honeycomb shapes and customize with the color that you like. Get creative with those colors and paint chips you never got to use together. Give your photos a temporary frame with washy tape and your wall will be a much more sophisticated. To make a temporary wall paper from fabric, add a liquid starch. This project is perfect for renters (apartment, dorms, condos). This project can be customize to fit your decor and you can come up with all sort of creative art ideas simply by using a piece of fabric. This project is perfect for babies room or toddler decor. Glow in the dark wall paint and stencils are an awesome display made for nighttime viewing and it s easy to do. Make a butterfly shape in a piece of paper, cut it, and glued it into your wall. This project is so incredible and really can change your space. All you need is only some rainbow string, nail and pallet, and this adorable string wall art is ready to beautify your space. 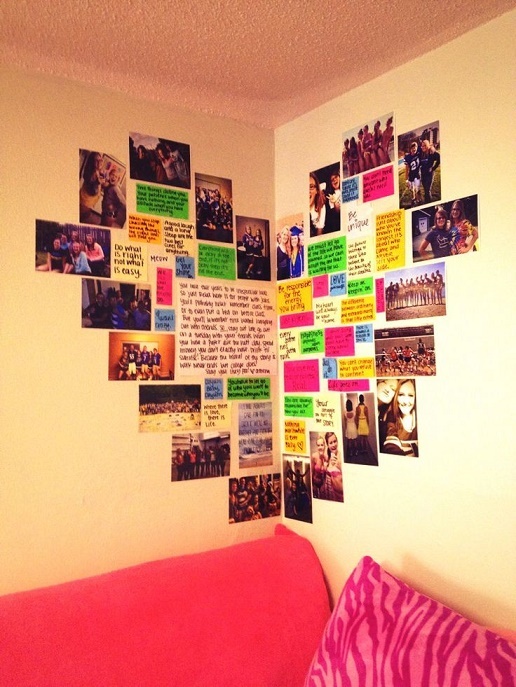 Pick some of your favorite and memorable photo, make a heart shape and stick it to the wall. This project is easy yet fun to do. Prepare some canvas and paint them with graphic gold. This project is so easy yet creating an expensive look for your wall. Do not throw away your toilet paper rolls. Repurpose them into this beautiful wall art. Be creative by making a cool geometric patterns with the cut tubes.